BEFORE - this "daybed" is actually the headboards from two twin beds. I guess you can tell that I have already covered the side slat - which is actually now the front of the daybed. fabric - this bed took 7 yards - measure top to bottom of one headboard and multiply by 4. Add one yard just in case! welting - measure headboard "edge" and multiply by 4 for yardage. The back and front (side slat) are actually upholstered - the only actual slipcovers are over the headboards. Cut your sides: Trace around the headboard with a pencil or fabric marker. If fabric is patterned (like this one) be sure to align so that patterns are straight and going the right direction. Cut 1/2 inch outside your line markings for seam allowances. Cut 3 more of these pieces. Cut your edges: Headboards have thickness that needs to be allowed for. Determine how "thick" it is - this will be how wide you want your edge to be. In this case it was 2 1/2 inches. This piece needs to be as long as the two sides and top of the headboard. Cut 2 of these pieces -add 1 full inch to the width to allow for 1/2 seams on each side. Cut batting piece for each side and edge: Cut a piece of low-loft cotton batting for each piece of the slipcover and baste to the wrong side of the corresponding piece. Attach welting to edge pieces: Welting is not required, just a matter of taste. Some pieces really look better with welting, some don't need it. If you are going to use welting, add it here. Add second side of welting to side piece. Attach edge strips first to one of the side pieces previously cut, then the other. This will end up looking somewhat like a padded envelope. Sorry no picture for this. Do the same for the other side cover. Upholster "front" side slat - cover what will be the front side of the day bed (as seen in the BEFORE picture). Cut a piece of fabric as long as your board plus 2-4 inches. The width of this piece should be twice the depth of the board you are covering. Cover the side slat with at least 2 layers of batting. For this piece I used high-loft batting. Attach loosely to the board. Wrap fabric over batting and staple tightly as in picture below. I like to use upholstery edging for this because it gives a nice finished edge - but it is not necessary. Now make the "back" of the daybed. The problem with using a traditional bed as a daybed is that there is nothing to lean back on - so I added this board across the back the help with this. Cut a piece of 1x6 or 1x8 lumber the same length as the side slats. Cover it exactly as you covered the side slat. I used a fabric that matched the mattress coverlet. 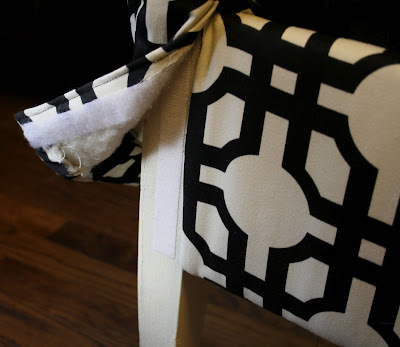 There will be enough of your slipcover fabric for this step, should you chose to you that. 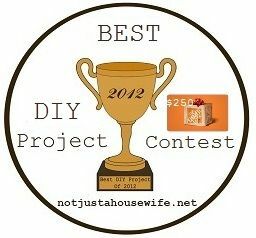 Attach two mending brackets to each end of the back board you just covered. You are now ready to slip on your slipcovers. The slipcovers were a little looser than I wanted so I wrapped the headboards with leftover batting and basted the edges together. At the bottom of the cover you will need to adapt the fit to go around the spot where the sideboards attach to the headboard. 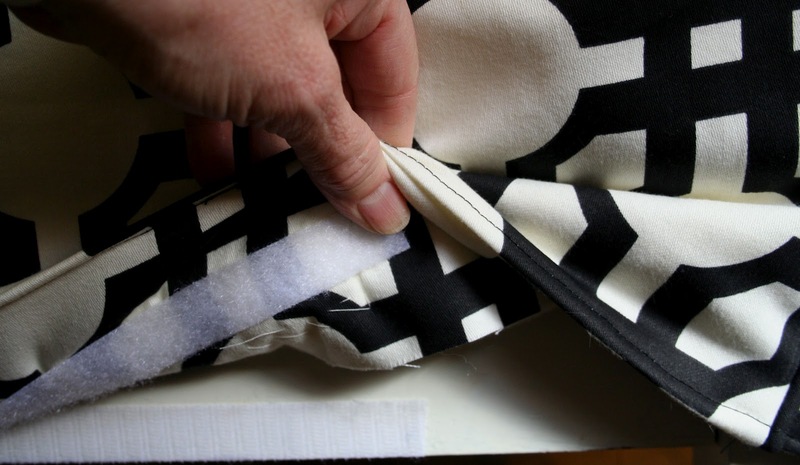 Use a seam ripper to open the seam up and begin to shape the slipcover to fit around the area where the brackets attatch. You may also need to trim the cover to the proper length. Pin everything in place and then hand stitch. Now put the bed together. Put the box spring and mattress in place. Hold the back board up to the backside of bed and determine where you want it to sit. Fit and mark the points where the brackets need to attach to the headboards. Use your seam ripper to open up 1" sections of the slip cover - where you will insert the brackets. There is a lot of batting inside those holes that will keep you from attaching the brackets. Part of that needs to be removed. Pinch out a hunk of this batting and cut it out. This should give you a space where you can pre-drill the hole for the screw that will attach the bracket to the headboard. Now breathe a huge sigh of relief because putting that back on is not very easy to do all by yourself. I recommend a helper for this. Attach Velcro along the bottom outside and front edges. I used sticky Velcro. It stuck perfectly to the wood, but not so perfectly to the fabric. I had to slip stitch the Velcro to the fabric. This was not fun. It is hard to sew through the sticky Velcro - the sticky stuff sticks to needle and makes it a little hard to sew. You need a thimble for this or the holes the needle makes in your fingers will bleed all over your fabric like I did. WAS HARD! Speaking of the hard scale - it goes like this: making the slipcover, EASY. Attaching the slipcover, challenging but PRETTY EASY. Doing the tutorial, VERY CHALLENGING but I learned a lot. Bed - Purchased both beds for $5. Pretty good. Batting - One package queensize low loft cotton batting - $16 (50% off @ JoAnn) high loft was from my stash. So if you have stuck around through this whole thing you should be rewarded with a few more pictures - or I should get to show it off a little bit more. Hey thanks Heather. Some really nice ideas on your blog...I'm following you now. Thanks Heather. It means a lot to get comments - especially good ones. Actually I should probably mention somewhere in the post that making the slipcover was easy. Attaching it was a little more difficult. Writing the tutorial was the most difficult. 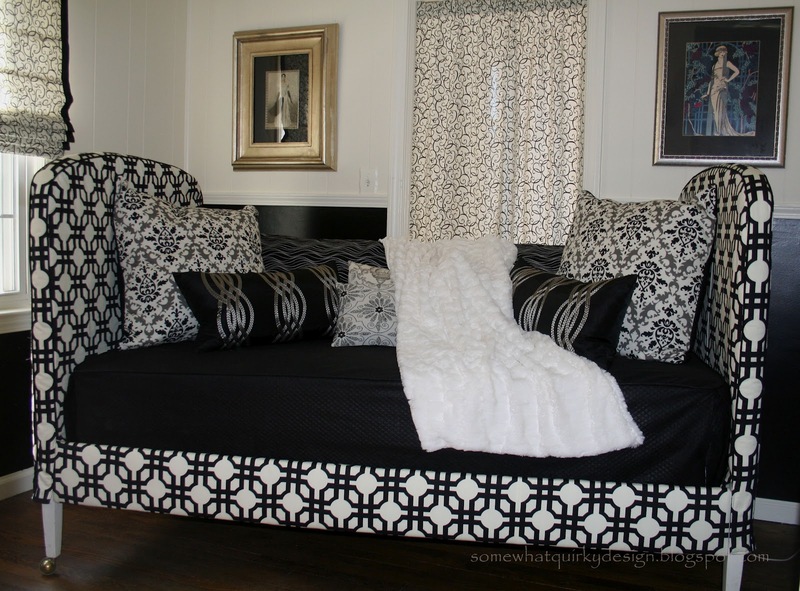 That is impressive.......love the black and white and really love the idea of using two twin headboards to make the daybed. VEry cool. Thanks so much. I gotta say, I love this bed. It turned out sooooo good. It looks even better in person. THE READER loves it too - and that is most important. She even Pinned it! My first PIN!!!! So exciting. 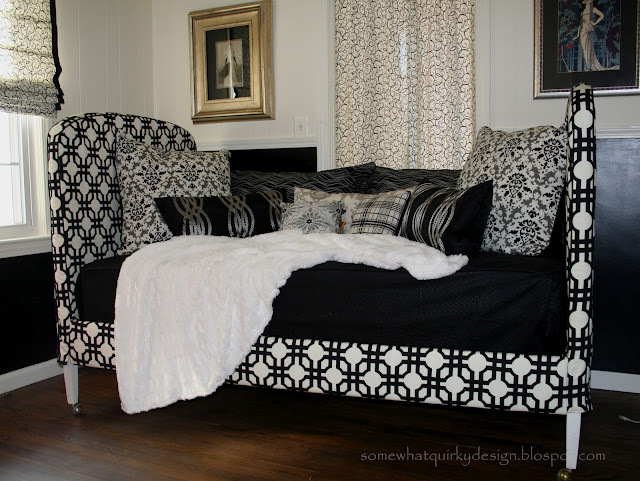 I featured you and this fab daybed on my blog today!! Oh Claire, you are too kind! Thanks you soooo much. What a thrill! This is Jennifer, Karen's friend, and owner of the day bed. What can I say? Are you JEALOUS?!?!? Karen is amazingly talented - I had been looking for day bed ideas for over 2 years. I've seen A LOT of day bed ideas. None of them really did it for me except for a no longer available $3K Restoration Hardware piece. The finished project here is stunning - every bit as good as the RH piece. These pictures don't do it justice. I am incredibly picky and I've never seen anything like this. It sprang, fully formed, from Karen's head to my house. Not only that, the craftsmanship on this is unbelievable. What Karen neglects to mention is that she did this as a GIFT for my Elf - my boyfriend who just moved over 800 miles to move in with me. And, never once was she anything but excited about the project. All of these hours of work, which I could not have afforded right now! - to welcome my sweetie to town. So, not only is she talented and creative, she's extremely caring and giving. When I bought the bed sets a church rummage sale I never imagined they could look so good! I had the daybed set up "as was" for probably 18 months. Karen mentioned slip covering it when I first bought it but I was hesitant. I had something different in mind. You have no idea the job she had to convince me to try this. How lucky can a girl be? WOW! So sweet - and thanks for pretending not to notice that I snitch your Dove Bites and oreos! How CLEVER of you - and very nicely done, too! I am going to be on the lookout for twin beds, and I'm going to follow you! Thanks Revi. I would love to see what you find - and be glad to help you or just encourage you. Love the daybed! Need a daybed! Oh, please don't get me started, I have soooo much else to do! I'm your newest follower, you can dance! (tee hee, I do the same). I'm so glad you are inspired. Yes, I am dancing - on the inside - because my knee is as bad as yours. Wow! Great job! It's beautiful! Thanks Roeshel! It is one of those things that turned out as good as or better than my vision. That is very gratifying. I think the fabric was what made it. Thanks ARod! I'm glad you liked it. We have a lot in common - both been blogging since Dec 2011, both Cancer, both love Eat, Pray, Love. Thanks for following! Amazing! Love the black and white!